An FBI Rancher in GTA Vice City.. 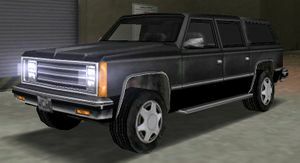 The FBI Rancher is an FBI vehicle featured in Grand Theft Auto: Vice City and Grand Theft Auto: San Andreas, as a consequence of reaching a five-star wanted level. It is known as the FIB Rancher in Grand Theft Auto: Chinatown Wars. The FBI Rancher exists in Grand Theft Auto: Vice City Stories, but is not found under normal circumstances. The FBI Rancher is a longer four-door SUV based on the two-door Rancher SUV, additionally sporting only a black body color and a non-visible strobe light on the dashboard. The GTA San Andreas version sports off-road tires. It resembles a 1981-1991 Chevrolet Suburban, the four door relative of the Chevrolet K5 Blazer. However, the FBI Rancher features a camper shell, a feature only seen on Blazers of the era. The FBI only used the FBI Washington in Grand Theft Auto: Vice City Stories instead of using the FBI Rancher, like in GTA Vice City. The FBI Rancher is never used in the game and can only be spawned using CheatDevices. The GTA Chinatown Wars rendition is actually based on the game's depiction of the Cavalcade, but features "flat" front-mounted bullbars, as well as the standard black body color, a siren and trunk lid-mounted strobe lights (blue and red), and an on-board police computer. In addition, the GTA Chinatown Wars rendition, like most police cars, grants the player five Shotgun rounds. Except for the PlayStation 2 version of GTA Vice City, no game renditions of this vehicle can be resprayed at the spray shop, as they are deemed "too hot" to be repainted. GTA Chinatown Wars (as an "FIB Rancher"). The FBI Rancher is four-wheel drive, giving it good traction and strength. It is longer in length and substantially heavier than the normal Rancher. Despite this, the FBI Rancher with its throaty engine is one of the fastest law enforcement vehicles there is, being capable of high speeds that rival other law enforcement vehicles in their respective games. Its steering and braking is also competent, with lesser tendency to spin out due to a properly-adjusted four-wheel-drive system. The vehicle's weight is also helpful in Vigilante missions, as the job of stopping most smaller cars is made easier. Being equipped with a siren, the FBI Rancher can also be used, with the exception of GTA Chinatown Wars, to clear the road ahead from traffic. In GTA Vice City, the FBI Rancher shares its engine sound with the Sabre and horn sound with the Rancher. In GTA San Andreas, the player can change the black paint of the FBI Rancher by using a mod garage hack or a trainer capable of changing car colors. In GTA Vice City though, the black paint is a permanent texture of the vehicle (much like the Sabre Turbo's red and white stripe scheme), and is actually "taxi yellow" in-game. In GTA San Andreas, the FBI Rancher has a unique horn, a note higher than the regular Rancher's. It is actually exactly the same as the Yakuza Stinger's horn in GTA III. The FBI Rancher is not normally available parked in a specific area in neither game. As a result, the vehicle can only be stolen by the player when the player achieves a five-star wanted level. The difficulty of acquiring the vehicle is compounded by the fact that the player must deal with MP5 gunfire from FBI agents. As the player is also unable to respray the vehicle in order to eliminate their wanted level; one strategy is to hold themselves up at Wang Cars in San Fierro in GTA San Andreas, where multiple civilian cars are available. Once the player gains an FBI Rancher, the player must then switch to a civilian car that can be resprayed at the nearby Pay 'n' Spray, thus eliminating police attention and being able to save the FBI Rancher. Another method is to steal a Rhino from Area 69 and drive it into the hangar at Verdant Meadows. FBI Ranchers will frequently follow the player into the hangar. The player can then make a quick dash to the save point, thus eliminating the wanted level. Another very simple method of obtaining it is to enter the Easter Basin Naval Station, using a fast vehicle, then immediately make a run for the Doherty garage, as the player will be pursued by the FBI. There the player must quickly save, losing their wanted level. The FBI will then either exit their vehicle, simply leaving it there and walking around; or after sticking around for a few seconds, leave in it. Either way the player will have enough time to steal it, place in their garage, then save again. Spawns in a parking lot at an LCPD station in northern Varsity Heights, Algonquin. FIB SUV: a similar law enforcement vehicle in Grand Theft Auto V.
This page was last modified on 8 February 2015, at 06:24.